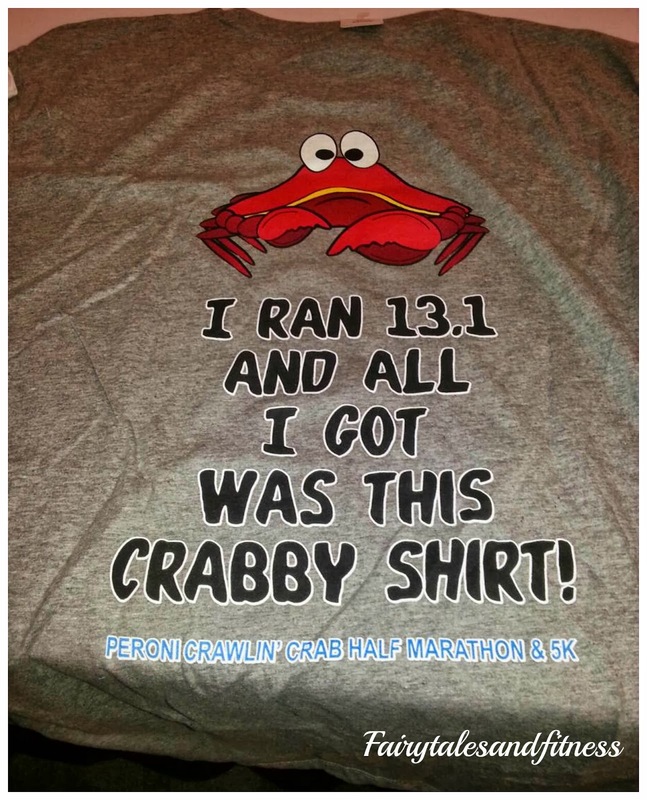 When I was able to get off work early this weekend I was excited, because that meant I was able to run the Crawlin' Crab half marathon in Hampton Va. Because I was not planning on running this race, I had not run for a week prior to this. However, my last long run was 13 miles, so I thought I would do just fine. 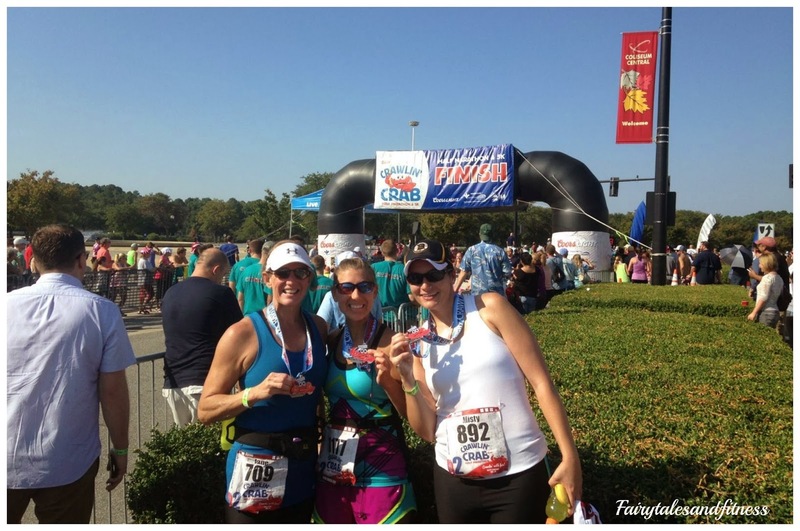 My only goal was to beat my Rock and Roll half marathon time from last month. I signed up for the race right at the expo. Even though it was last minute, I had no issue with getting the right size shirt. The lady told me to just go over and pick a size. Good thing it was a small-ish race. There were only a total of 2352 half marathoners. 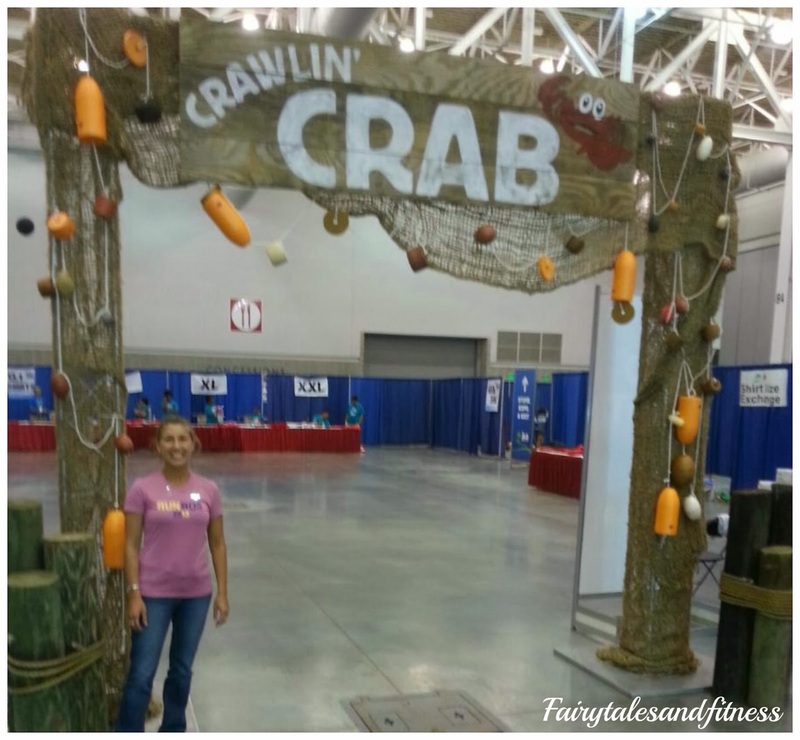 This expo was much smaller than most too. 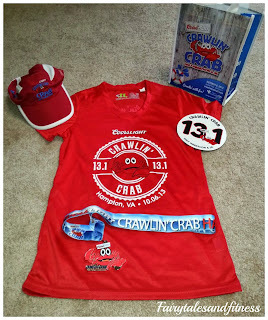 After grabbing my shirt and bib I looked at some of the official crawlin' crab race gear and some expo booths and then it was home to prepare for the big day. We arrived at the race in plenty of time, found a parking spot, and the lines for the restroom was not even long. Soon enough it was time to make my way to the starting line. 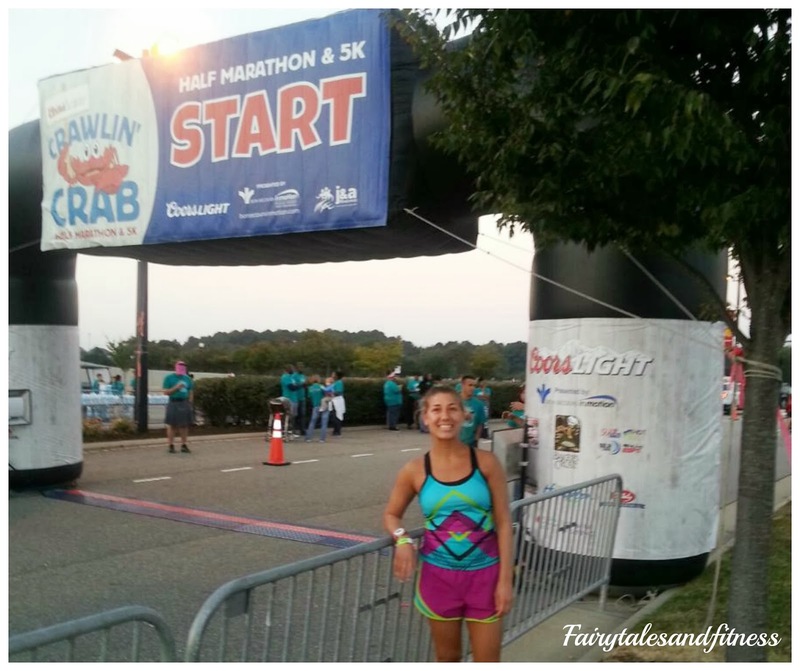 Because I didn't train specifically for this race , I knew that it was not going to be a PR for me. I just wanted to run and enjoy myself. And that is just what I did. You couldn't have asked for better weather (last year I heard it rained). It was a beautiful course! It was along the river and mostly flat. I felt great during most of the race. Because I didn't plan on running this race, I didn't train well. Because of that, I was worried that this race could go either way. It was either going to hurt me (by not training for it) or I would do great(because I didn't have time to stress about the race). Sometimes I feel like I put too much pressure on myself before races. I always have a goal in mind and if I don't meet that goal I am disappointed in myself. But this was going to be different, because I didn't have much of a goal! Having just signed up the day before, I didn't have that additional stress of the training and worrying about the race months in advance. I didn't have that much time to think about the event before it was taking place. Where does the crab keep their clothes- In the clawset. Where does the crab go for drinks- At the sandbar. What is the crab's favorite show-Claw and Order. All things crab, afterall it was the crawlin' crab race! After reading a couple riddles I thought it was time to focus more along the course and stop reading. I finished the race about a minute earlier than I did at Rock n Roll. Even though I was not that much quicker than the race prior, I felt much better during this race, and the weather was definitely in our favor this time! After completing the race. We got a finishing photo and headed in to enjoy the after party. They had corn and crab chowder soup by Baker's Crust and Coors light that was provided to all the participants(since that was the sponsor). While eating and drinking we listened to the band Rich Whiskey. Do you stress too much about races? 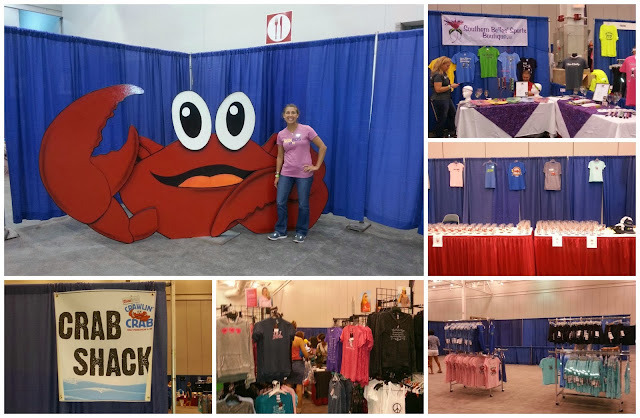 Yea, They had some cool products at the expo! Love the shirt and the bling. 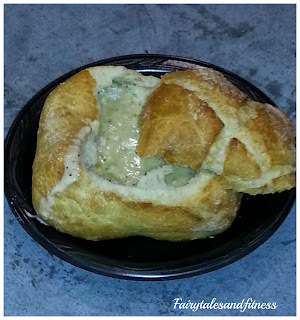 The chowder looks delicious in the bread bowl, though I might've taken one to go. I can't eat a whole lot right after a race. Sounds like you had a blast and, like everyone else, I'm loving the swag! I'm certainly a race stresser but I'm also a procrastinator so I only stress the night before the race or so! Works out usually! 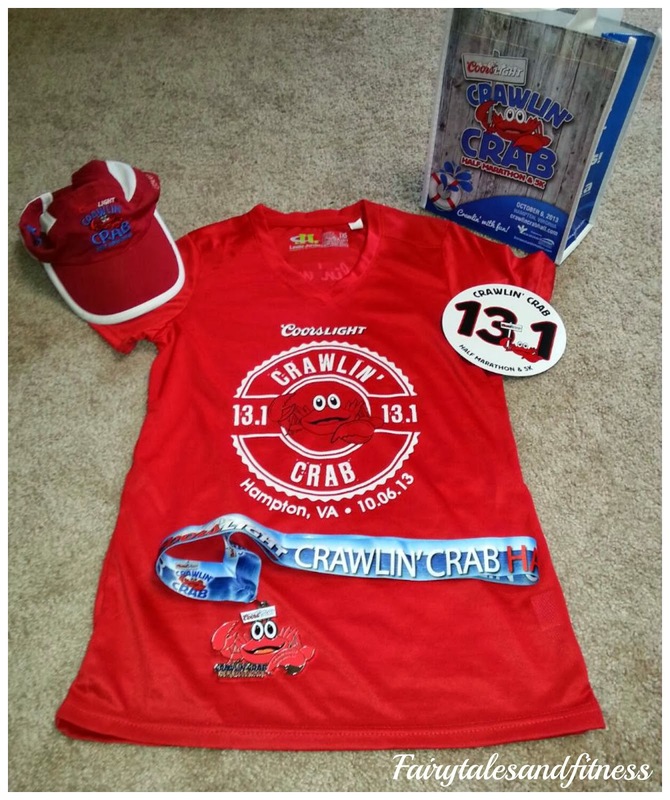 Yea, I got to say they did have great swag for this race! I'm loving that I get to add a little red to my race gear now! OMG I saw this on Facebook! I so wish I did it. I'm in next year. You can hold me to it! Congratulations on a great finish :) Cute swag. It looks like you had so much fun! Thanks Meg! I'll be looking for you next year! How fun! 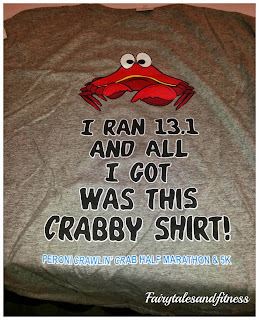 I love the punny jokes and race gear :) I think it is so cool you signed up for a half just on a whim. Even though I go into races with goals in mind too, the thought of signing up for one just for fun last minute without having to worry about anything sounds awesome! Yea, I definitely wasn't as stressed as I am when I sign up months in advance! Looks like a great race! The merch is adorable! Are You Ready For A Wicked Good Time? What Gives You That Boost Of Energy You Need? Who Likes Pumpkin Flavored Foods? Not Your Average Wordless Wednesday!